Imagine, having all the kitties you ever wanted without EVER having to change a litterbox! It's fur real folks, we're not hissing around... Become a KPOH.org KITTY CYBER SPONSOR and fulfill your dreams of having all the kitties you have ever wanted be the boss of you! We are all spayed/neutered and tested for FIV/FeVL. We receive appropriate vaccinations and are never over-vaccinated as sadly so many kitties are harmed by unnecessary yearly vaccinations. We, are always in the best vet hands when we become ill or require surgery/hospitalization. It's not our fault that we are special needs kitties, but we are purry happy here with our kitty friends and family and would like to continue thriving with proper feline nutrition and in kitty enrichment environments. A few of us have compiled our hisstories below. The other kitties will get around to it once they are finished with their important cat stuff which includes, but is not limited to scratching, cat napping, purring, vomiting, making biscuits, batting things under the furniture, hissing and gold digging in the litterboxes. You can find many more photos & stories of us on our Facebook page and Instagram with over 5000 photos as Meow is a major pawparazzi enthusiast... (she's loves posting happy kitties). Click here to SPONSOR US! 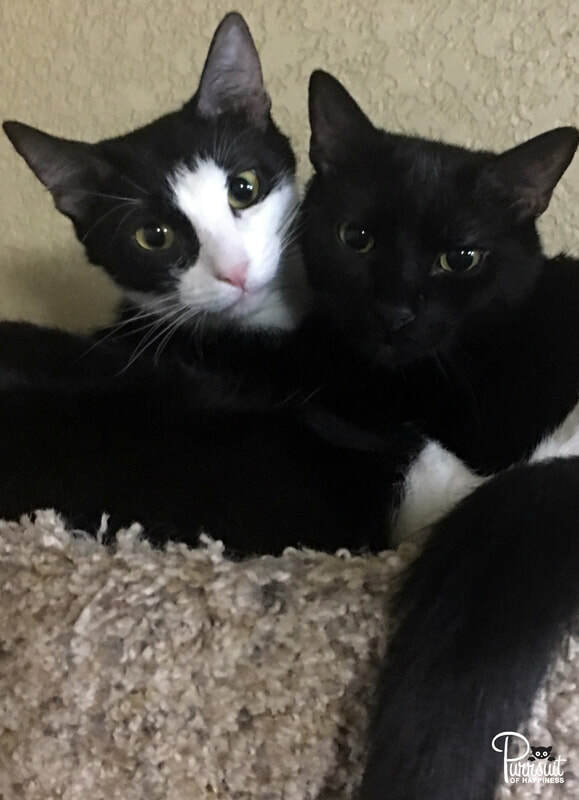 This is Us, Turbo & Laser!​ We are brothers who were rescued at different times, but are so happy we are now safe and back together. We are both very feral but the Meow Matriarch didn't think that since we were only 13 weeks old, that we should be left out in the streets to die. Dolly and Demi are our other siblings who are safe with us. Me (Turbo) really put up a fuss and didn't know what being rescued was all about. So, I stayed out doing my best at big cat surviving stuff, for a few more weeks. It was so hard having fleas and ear mites constantly biting me and making me anemic, I had no where safe to sleep and was always on the run from predators and vehicles. Lucky for me, Meow didn't give up and I finally surrendered because I just was so hungry as I hadn't eaten in a very long time. It's nice to be back with my brothers and sisters and we take care and play with each other. We don't really know what humans are, but that seems to be ok because we are with a whole bunch of other kitties who are nice and became our extended family. We love being in our safe indoor jungle and happy that we were given a chance to live! Click here to SPONSOR ME! This is me, Rumor!​ Although I'm a great ol' chap, it's difficult for me to sing without my teeth. I was rescued from the streets in terrible condition, emaciated with a bleeding raw throat and mouth. I couldn't eat because when I would try to swallow, I would scream in pain. It was awful and the Vet said he never saw such a bad situation as the one I was in. I had to go to an oral surgeon and it was very expensive. I had to wait while the Meow Matriarch did her best to raise the thousands of dollars that was needed to make me better. She was sad that it took a long time and that I was suffering, but I knew she was doing the best she could as fast as she could. She even learned how to sew so that she could raise money for me. Eventually surgery happened and made me feel so much better again. It's so wonderful to not have to be in pain and not have pain medications help. I can eat now without screaming. I still have health issues and I'm not the healthiest kitty there is, but I am loved and cared for and that is all that matters to me. I didn't have that before. But meow, I'm the luckiest kitty in the whole wide world! Click here to SPONSOR US! This is us Charity (middle), Hope (front) & Faith (back)! We are matching triplet sisters and our life story has been sad. Our mom, sister and us were dumped at a Starbuck's drive-thru when we were very little, and our mom and sister were killed. Luckily the Meow Matriarch happened to notice when a car almost ran us over too and rescued us on the spot. We didn't know what was happening nor that our mom and sister had died. It all happened so fast! We were adopted but our forever mom was in a car accident and sustained a head injury and she couldn't take care of us. Faith is FIV+, Hope likes to love bite and I'm just very shy, but we are very bonded and fortunate to be able to stay together and take care of one another in the Princess Room at KPOH.org. Thank-mew for caring about us! Click here to SPONSOR ME! This is me, Petra! I am a very tiny, petite black kitty who is extremely feral. You see, I lived in the woods doing my best to survive with predators and the rest of the wildlife. Even though I was rescued and only five months old, I still didn't have the luxury of knowing that kindness could come from humans. My mom and family didn't either and we all did whatever we could to find something to eat, and to run away from danger as fast as we could. It's amazing how my life has changed! I was running a very high fever when I was rescued and it took several weeks for me to get better but there was no way the Meow Matriarch would just turn her back on me and "TNR" instead. I now live inside where it is safe, and I have other kitties to play with and protect me. The rest of my family didn't make it, but I did. I want all humans to know that they should be kinder to animals and not just dump us to take care of ourselves. We can't and it's not fair to do this to us. In honor of my family, please sponsor me so that I can continue to be loved, safe and cared for. It's the bestest feeling in the whole wide world! Click here to SPONSOR ME! This is me, BRAYDEN! I'm a very handsome, young gentleman if I do say so myself! I am the older brother to Brianna and Braxton and my right eyelid was injured when I was a baby so some people think this is an impurrfection. It's sad, because it wasn't my fault. It's not easy being a baby surviving outdoors and my family almost didn't make it. My sisters and I would climb up into vehicles for safety and shelter. We burned our whiskers off but they are growing back. We didn't know that it was dangerous, there was no other place that covered us from the elements. One day, Brianna and I were so hungry that as soon as we smelled yummy food, we walked right up to it without knowing... our lives were being saved and were going to be changed forever! We were going to make it! We were so excited and it was so nice to have a bath and get all fleas and dirt of me. I even had something called a bed which was super comfy and even "toys". They are so much fun! I still live with my sisters at KPOH's sanctuary and it would mean so much if you can care about me and become a sponsor hero. I promise I will blow cyber kisses daily along with a wink of my good eye! Click here to SPONSOR US! This is us, PIPER & Dalton! Although KPOH is doing their best to "socialize" us, we are very timid and prefer not to be handled. I was rescued during Hurricane Harvey along with some other lucky kitties, but Dalton was rescued a few weeks earlier. We have become the best of pals and have many other wonderful kitties to play with here at KPOH. Dalton doesn't like his nickname "Dolly" but mine is "Pipes" and I like it a lot!. He thinks it should be the other way around... We are very playful and adorable but we scared of humans. It's not our fault because we didn't grow up with human kindness. Dolly and I often curl up and snuggle together and he likes to lick me most of the time. It's so nice to not have bugs crawling on us and have full tummies. We would love to have you as a cyber sponsor so I can look forward to a very long happy live safely indoors! Click here to SPONSOR US! This is us, BAILEY (left) & CHIVAS REGAL (right)! Meow Matriarch would often see me wandering from house to house looking into windows hoping that people would see me and would help me. No one ever did. Even when my eye got hurt. No one cared. No one ever cared that I was cold, hurt and hungry. I looked into so many windows.... I met a little calico girl named Bailey who was too young to be pregnant. She was awfully sick too. I may have been the baby daddy, but I will never tell. I tried to take care of her which made it even more important for me to try to get humans attention. I didn't know that the Meow Matriarch saw my efforts and it broke her heart. I didn't know that one fateful night as Bailey's fever was really getting high, that we would both be rescued and saved. Bailey lost her babies and I lost my eye, but we didn't lose our lives. We are both feral, but we are loved, cared for and very safe here at KPOH. We live in the jungle sanctuary and it's so fun! I get to still take care of Bailey even though we have new friends now. Click here to SPONSOR ME! This is me, BRIANNA! I was rescued with my brother Brayden in June this past summer from a busy intersection that was also undergoing construction and landscaping at a residence. We were running across in traffic and no one cared. We crawled up into vehicle engines and burned our whiskers off even. Why didn't anyone care? We were just tiny weeny babies for goodness sake! Click here to SPONSOR US! This is us, SMITH (right) & Wesson (left)! Together, we are the perfect love arsenal! My brother Wesson, Zorro, my Mom and I all came to KPOH a couple of years ago as my mom Rio was just a tiny kitty herself trying to take care of all of us at an apartment building where we weren't wanted. Infact, when my mom would try to get some food there was a mean lady who would hit her with a broom. She even did that to us while she yelled at us to go away. What did we do wrong? My mom was only trying to take care of us the best she could. Help finally came when the Meow Matriarch rescued us. My whole family was saved and we are treated so nice! We have a soft bed to all sleep together, food for my mom because we were still nursing. We were never mistreated again. However, Zorro was the only one out of our family who has been adopted. I purrfur not to be picked up nor petted, but Wesson is very loving and likes the attention. We love playing with all the kitties in the jungle sanctuary and still get an occasional swat from our mom!